wanderlust ATLANTA: Georgia Dome: Go Falcons! 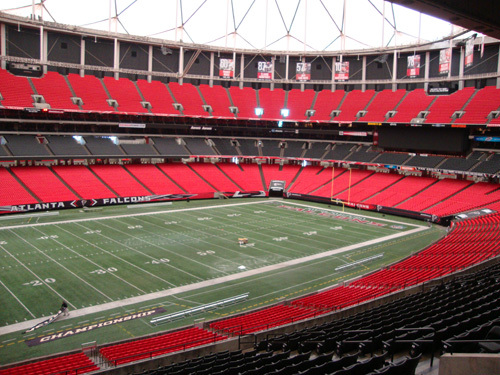 For fans of football and/or amazing feats of architecture, a tour of Georgia Dome may be the ticket you're looking for…and it's one of the best deals in town at only $6. 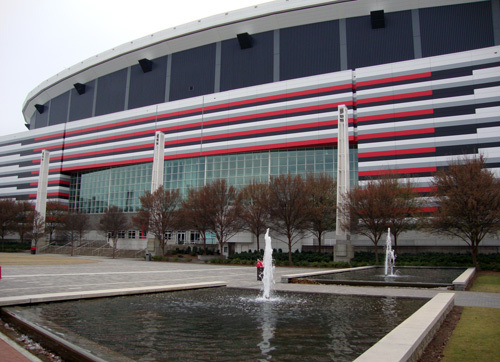 Home of the Atlanta Falcons, Atlanta's NFL home team, Georgia Dome has been a landmark structure in the Atlanta skyline since 1992. Be sure to arrive with fully-charged batteries and plenty of room on your camera's memory card…photos are indeed allowed! And to my surprise, my tour guide offered to take a few of me during the tour (I usually have to ask). 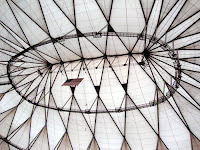 Georgia Dome is the world's largest cable-supported domed stadium in the world. Unmistakable in the Atlanta skyline, when it was first built its roof was compared to the back of a turtle, except that it's white with dark red lines marking the crest of its ridges. 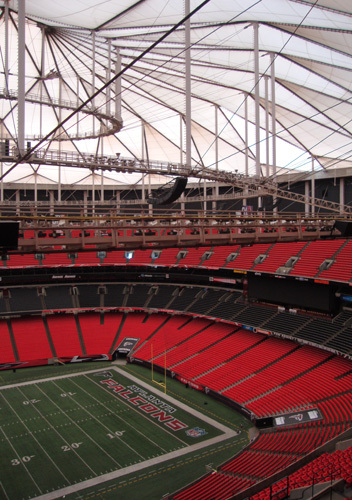 Soaring 290 feet into the air, the roof is made of 130 Teflon-coated fiberglass panels. Only one of the panels had to be replaced following the 2008 Atlanta Tornado, which you'll recognize at the south end of the stadium by its slightly brighter appearance. 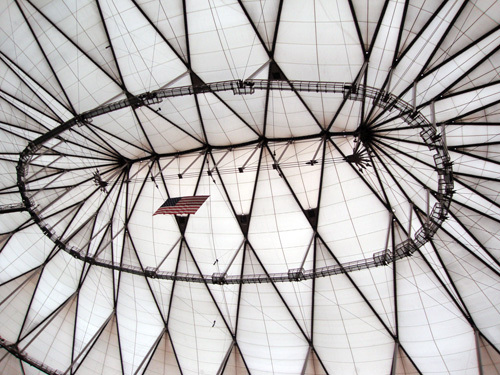 The Dome's interior is illuminated by natural light, filtering through the white panels of the roof during non-game and non-event times. Even on an overcast day like the one on which I toured the Dome, the lighting was quite good (I didn't even know the lights weren't on until told). 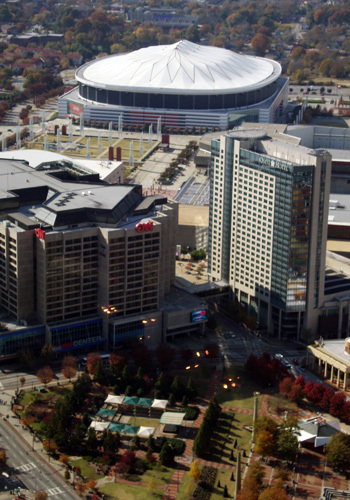 The Georgia Dome, Centennial Olympic Park, and the Georgia World Congress Center are all run by the Georgia World congress Center Authority and they're state-owned. The complex is one of the largest combination sports, entertainment and convention center facilities in the world. 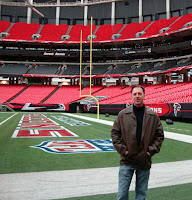 I'd actually planned to tour Georgia Dome some time ago, but a litany of circumstances precluded my having made it earlier—except for the one time I tried but was not able to get in because they were filming, thus they were not offering tours that day. Lesson learned: call ahead of time, just to be on the safe side. But even if for some reason you can't get in (probably just luck of the draw for me that particular day), the Dome is near some of Atlanta's hottest tourist attractions, so there's lots to do nearby. I found it coincidentally odd that on the day of my tour the condition outside totally reminded me of football weather—below 40 degrees Fahrenheit, a little ice here and there, and overcast…at least that's what I think of as football weather, and that's exactly what it was. I was feeling happy that Georgia Dome is an enclosed facility. When I arrived at 11:50 a.m. for my tour (a great way to spend a lunch hour! ), I'd just missed the previous tour group. The next tour was not until 1:00 p.m., so I walked over to Georgia Aquarium for a quick lunch and had time when I came back to make a few snapshots of the outside of the Dome. Shortly after one o'clock, I was greeted by my tour guide, Monica. Obviously in her position based largely on her charm and professionalism (and visitor safety, as I would see later), Monica was a fantastic guide. The tour of the 71,250 seat stadium starts at the welcome desk near the Administrative Entrance. Faster than a Matt Ryan pass, we were at the Observatory Deck, the highest point on the tour at more than 200 feet above the field, and the highest point in the Dome unless you're on staff and one of the engineers working on the roof or ceiling of the Dome. A quick stop in the Press Box, at the 50 yard line, shows visitors from where the magazine and newspaper media report on game day. Of course no sports venue tour would be complete without a visit to the suites (sell, sell, sell…and they're worth every penny, by the way). Celebrities, executives and their lucky guests get to enjoy one of the Dome's 164 Executive Suites that seat 16 to 24 fans. And recently added are eight Super Suites that can accommodate up to 96 people. The really cool thing about the Super Suites is that individuals can buy into them. Beverages and food are included in the more than $3,000 season price for the suite, but you have to purchase your alcohol, but it's served by an in-suite bartender. 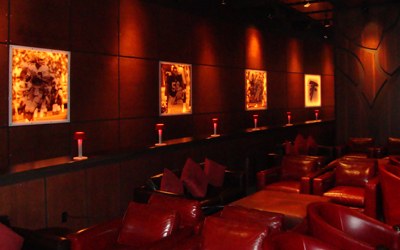 There are two Club Lounges, on the Club Level (clever, right? ), that serve premium beverages, high-quality (sports arena) food, and sweeter desserts than you might find on another lower level. The Lower Level seats, especially those nearest the 50 yard line, are some of the most coveted, even more than one of the leather chair seats in the suites. Georgia Dome hosts some incredible entertainers and specials events, so there's a lot of time you're on your feet applauding or cheering for your favorite performer or contestant anyway. If I were asked to describe the Georgia Dome with one word—one that I would not have used prior to the tour—it would be "open." Even though an indoor venue, you get a strong sense of openness. Contributing to that feeling I'm sure are the opaque ceiling (a lot of natural light comes through the paneled ceiling) and the flatter inclination of the seating areas. Also on the tour are the visitors and Falcons' locker rooms. Tours are not given on game day, so no worries that your visit to the locker room will turn into a celebrity-spotting opportunity. The best stop on the tour is…the Field. Team logos are painted on the field, frequently, with washable paint. There was a team doing just that on the north end of the stadium while I was there. Monica took me to the south end of the field where I got to have a photo made fairly close to the goal post. We’ll call that a "touchdown!" One of the things that Monica pointed out was that the Dome gave up using Astroturf and now uses FieldTurf, which is engineered to look, feel, and play like real grass. She said that there's a machine that "fluffs" the grass. That sounds to me like a great savings…not having to water a lawn the size of a football field. 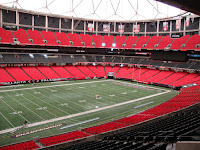 Another couple of interesting tidbits about Georgia Dome are that it has three times the number of restrooms required by state code and there are more than 800 televisions in the Dome, including in the restrooms. 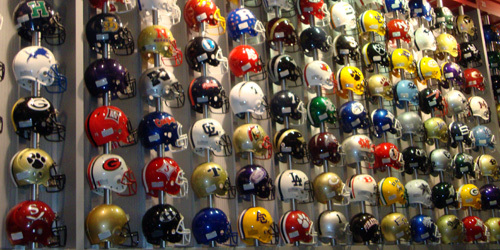 You can go for a snack or to shop for a souvenir jersey and you don't have to miss any of the action. Not unless your face is buried the BBQ available on the Club Level. I'm told it's some of the best in town. At the end of the tour, Monica treated me to a souvenir Falcons "Defend the Dome" sign. Now, the next time I'm watching a game with my buddies, I'll be properly prepared to root for the home team. Oftentimes, especially in a city with a warmer climate like Atlanta, the grounds (the exterior spaces) are just as interesting as the interior. The Georgia Dome grounds do not disappoint. The courtyard immediately between Georgia Dome and the Georgia World Congress Center features a center that is landscaped to simulate a football field. Exactly the size of an official football field, and marked with yard line measures, the courtyard's grassy area is in the shape of a football. 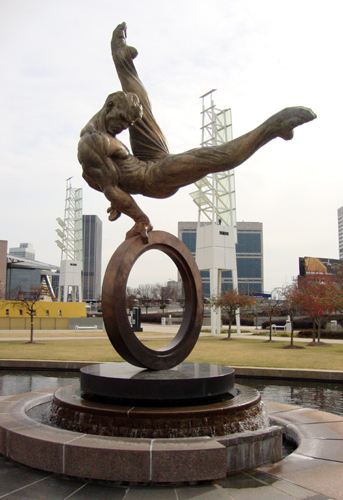 The other surrounding areas include dramatic lighting pylons (visible from many vistas around the city), fountains, ponds, flowers, seating, and a massive statue of an Olympic gymnast (titled "The Flair") commemorating the Dome's involvement in the 1996 Olympic Summer Games. Did Georgia Dome score high enough to entice me to return? When I have a friend who is a football fanatic, it's exactly the tour I'd be happy to treat them to. And I'm glad that I took the tour…now when I go to my first professional football game, I can pay attention to what's happening on the field instead of wondering about the script of the behind-the-scenes tour.